The Alienated Game is similar to a number of games that can be found on the Internet. The game is played with a bubble chart and interacts with the user via the mouse. The object of the game is to swap two images to create a group of three or more aliens in a row or column (please forgive the images of the aliens—I'm artistically challenged). 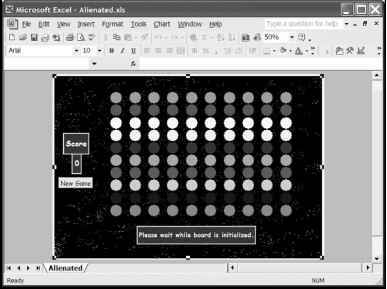 The Alienated Game I created for Excel is shown in Figure 9.1.